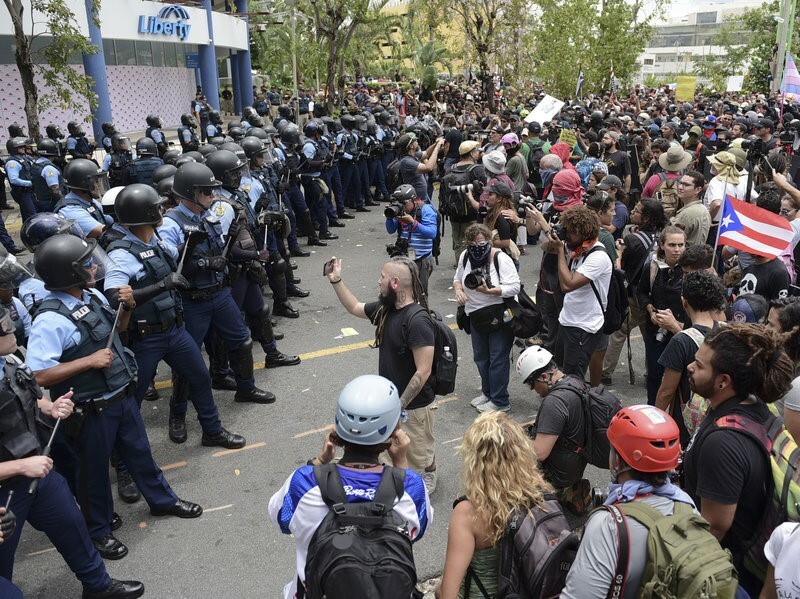 On Tuesday, a protes t march in Puerto Rico’s financial district turned violent. The island appears to be in chaos and record numbers of residents are moving to the United States. The island’s financial health is dire, yet Puerto Rico is unable to declare bankruptcy under applicable federal laws. In response, the federally appointed PROMESA board, in the words of Puerto Rico’s Governor Ricardo Rosello, “tries to ram policy measures down our throats.” All of this is taking place in conformity with the United States Constitution, a document apparently committed to freedom and democratic principles. How did Puerto Rico come to this moment in history? What explains the economic peril in which the island finds itself? How to make sense of the status of the island and its citizenry as part of the larger American experiment? One questions stands above all others. Puerto Rico is a state, according to many federal statutes. Under 28 USC sec. 1332, “[t]he word “States”, as used in this section, includes . . . the Commonwealth of Puerto Rico.” Under the Uniformed and Overseas Citizens Absentee Voting Act, “’State’ means a State of the United States, the District of Columbia, the Commonwealth of Puerto Rico, Guam, the Virgin Islands, and American Samoa.” See also the text of the 14th Amendment, which specifically states that “No state shall. . .” The 14th Amendment explicitly applies to states. The 14th Amendment applies to Puerto Rico. Puerto Rico is not a state. Under the US Constitution, members of Congress are elected “by the people of the several states.” Puerto Rico is not a state, so it receives no congressional representation. Similarly, the Electoral College directs electors to meet “in their respective states.” Puerto Rico is not a state, so it has no electors and receives no representation is selecting president of the United States. Puerto Rico is a commonwealth. But so are Kentucky, Massachusetts, Pennsylvania, and Virginia. So that label doesn’t help very much. Puerto Rico is an unincorporated territory, according to the United States Supreme Court in the insular cases, decided between 1901 and 1922. This means that the US Congress retains plenary powers over the island so long as fundamental rights are not involved. This means, in other words, that Congress has the constitutional authority to appoint a financial oversight and management board for Puerto Rico without any voice for the island and its citizenry. The board thus takes us back full circle, to 1900 and the Foraker Act, the federal law that first established a civilian government for the island. The fate of the island is once again controlled by political outsiders, unelected by the people of Puerto Rico. Put indelicately, then: Puerto Rico is a colony, subject to the whims of the United States and its political class. Puerto Rico is, in other words, whatever the heck you want it to be, as it suits Congress in any particular moment. And the people of Puerto Rico, devoid of political representation in the halls of Congress or the electoral college, do not have any say in the matter. For an answer, look no further than the protest march of two days ago. The people of Puerto Rico know the answer too well.